Imagine champagne, roaring log fires, canapes, clear night skies, fresh powder, a team of staff to look after your every need. Dinner 6 nights a week, a selection of the finest wines & spirits, sitting in a bubbling Jacuzzi under twinkling stars, unwinding with a hot stone massage, a driver to chauffeur you from resort to resort. Yellowstone Ski Lodge is a luxury chalet and exclusive boutique hotel nestling between Val D'Isère and Les Arcs, in the idyllic Tarentaise village of Sainte Foy. 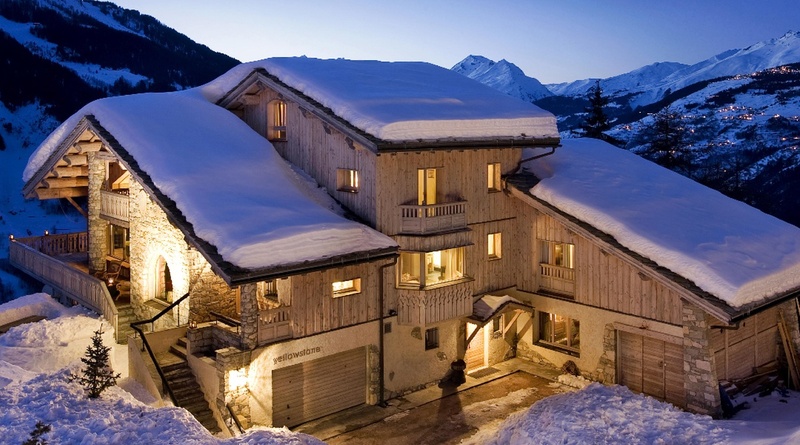 The Ski Lodge combines traditional features and modern luxury to spectacular effect. The stylish open-plan main living space includes a large open fire surrounded by soft, woollen sofas and a dining table fit for a banquet. You can step out of this room onto a charming terrace with unbelievable views of the mountains. Each of the lodge's six ensuite bedrooms is spacious, strikingly individual, warmly decorated and boast a flat-screen TV, iPod docking station and deep, luxurious baths. An adjoining gîte is also available, by special arrangement, for certain weeks during the season, allowing for groups of up to 23. If you are looking for something more testing, Sainte Foy has some of the most amazing backcountry and off-piste runs in Europe, offering acres of untouched powder (which is why you'll find the guides head there to ski on their days off). Not only does it have its own superb skiing, but Sainte Foy is perfectly located between Val d'Isère / Tignes, Les Arcs / La Plagne, La Rosière... all of which are between 10 to 20 min privately-chauffered drive away. If this isn't adrenaline pumping enough, you can organise a heli-ski trip to the Italian powder fields of La Thuile and Val Grisenche from the helipad just 100 meters away from your doorstep. How should you relax at Yellowstone Ski Lodge after a hard day on the slopes? You could have a soak in the outdoor jacuzzi (with its uninterrupted views up the valley). You could wind down in the hammam. You could have a massage in the treatment room. Work out on our state of the art kenosis techno gym. Watch a movie on our large flatscreen TV. Or, you could simply curl up with a book or your favourite daily paper on one of our large sofas, warmed by our open fire and surrounded by breathtaking mountain views. Yellowstone is also a fantastic party chalet... so if relaxing is not how you'd like to end an adrenalin-filled day off-piste, we've got it covered. Then there are the local bars and restaurants (and the nightlife of Val D'Isère nearby)... although our guests tend to gravitate towards their own surroundings, described as 'a temple to serious lounging'. Food is central to your stay at Yellowstone and is restaurant standard without being too fussy. Every day, your meals are prepared by our expert chef, using as much locally-sourced produce as possible. Breakfasts can be light or hearty and afternoon tea will be prepared with freshly baked cakes to restock your energy levels. In the evening you can have champagne or selected spirit cocktails with canapés around the fireplace before tucking into a three-course dinner served with wine. Our wine list is compiled by John Clevely (Master of wine) We're happy to cater for special diets, whether it's for children or someone with specific needs. Outdoor hot tub, sauna, treatment room, bathrobes, luxury bath and beauty products, flatscreen TVs, Digital satellite/Freeview, DVD player, collection of DVDs and music, iPod docks, study area with PC, WiFi, table tennis, small gym, house wine, house champagne, breakfast, dinner, afternoon tea, private chauffeured car to ferry you to local towns and resorts. Heli-skiing, ski guides, ski lessons, ski hire, insurance, massage in the massage room, health treatments, laundry, helicopter tours, husky dog experiences, children's activities, wines (other than house wine). The Ranch is available on a weekly B&B (continental) basis with a minimum stay of two nights at £300 per person for the first 2 nights. Then £100 per person for the subsequent nights of their week.